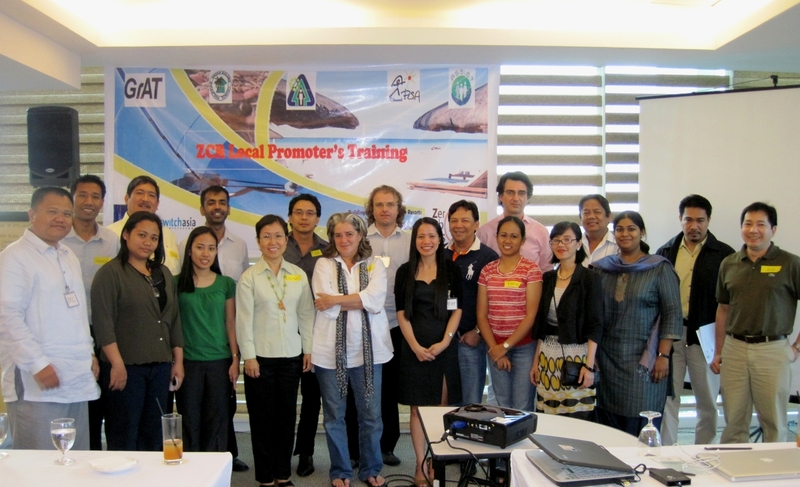 GrAT (Gruppe Angepasste Technologie), Asia Society for Social Improvement and Sustainable Transformation (ASSIST), Palawan Council for Sustainable Development (PCSD), CIEMAT-Plataforma Solar de Almeria (PSA), Spain, and Philippine Green Building Council (PhilGBC), conducted the Local Promoters’ Training for Zero Carbon Resorts (ZCR) Project last March 10, 2010 at the St. Giles Hotel, Makati City. Participants gathered last March 10 for the ZCR Local Promoters Training in Manila. The ZCR Project was launched in 2010 through the support of the European Union, with the goal of enabling tourism Small and Medium Enterprises in the Philippines to implement energy-saving measures and switching to renewable energy. Through the training, the Project Consortium aimed to equip promoters with the knowledge they need to encourage members of the tourism industry to adopt the recommendations under the ZCR guidelines. Among the participants were resort owners, representatives from the Department of Tourism (DOT) and Department of Science and Technology, non-government organizations advocating environmental issues, and suppliers of renewable energy products. Ms. Arlene Alipio, Officer in Charge of the DOT Standards Development Division welcomed the participants in behalf of the DOT Undersecretary and lauded the efforts of the ZCR Project Consortium to promote sustainability in the tourism industry. Speakers include GrAT Chairman and ZCR Project Lead Dr. Robert Wimmer, Dr. Diego Cesar Alarcon-Padilla of PSA, the largest European center for research, development and testing of concentrating solar technologies, Mr. Butch Tan of Puerto Pension and Daluyon Beach and Mountain Resort in Palawan, Engr. Eric Raymundo, GrAT senior technical expert, and Ms. Margeret Neena, ASSIST Project Manager. Dr. Wimmer explained the project details and the role of promoters, while Dr. Alarcon-Padilla discussed the fundamentals of energy and why renewable energy is a viable alternative to the current sources. Meanwhile, Engr. Raymundo shared the contents of the Handbook produced by the ZCR Project partners, which outlines the changes that owners of resorts and recreational facilities can adopt to promote sustainable practices. Ms. Margeret Neena demonstrated how to use the project website, which will serve both as a database and a communication platform among the members of the network. Finally, Mr. Tan discussed the changes that he has begun to implement in his two resorts as an active member of ZCR’s Frontier Group 1. These include the installment of solar-powered lighting, louvers, water sprinkler system and other energy-saving contraptions.